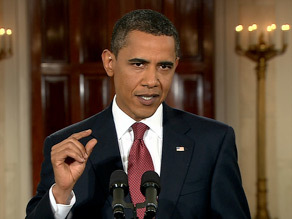 (CNN) -- President Obama took his health care reform push to the American people at a Wednesday night news conference. Here is a transcript of the conference. President Obama says long-term increases in the cost of health care must be slowed. Obama: Good evening. Please be seated. Before I take your questions, I want to talk for a few minutes about the progress we're making on health insurance reform and where it fits into our broader economic strategy. Now, six months ago, I took office amid the worst recession in half a century. We were losing an average of 700,000 jobs per month, and our financial system was on the verge of collapse. As a result of the actions we took in those first weeks, we've been able to pull our economy back from the brink. We took steps to stabilize our financial institutions and our housing market. And we passed a Recovery Act that has already saved jobs and created new ones, delivered billions in tax relief to families and small businesses, and extended unemployment insurance and health insurance to those who've been laid off. I realize this is little comfort to those Americans who are currently out of work. And I'll be honest with you: New hiring is always one of the last things to bounce back after a recession. Will Obama's health care plan mirror Clinton failure? And the fact is, even before this crisis hit, we had an economy that was creating a good deal of wealth for those folks at the very top, but not a lot of good-paying jobs for the rest of America. It's an economy that simply wasn't ready to compete in the 21st century, one where we've been slow to invest in clean-energy technologies that have created new jobs and industries in other countries, where we've watched our graduation rates lag behind too much of the world, and where we spend much more on health care than any other nation, but aren't any healthier for it. That's why I've said that, even as we rescue this economy from a full-blown crisis, we must rebuild it stronger than before. And health insurance reform is central to that effort. This is not just about the 47 million Americans who don't have any health insurance at all. Reform is about every American who has ever feared that they may lose their coverage if they become too sick, or lose their job, or change their job. It's about every small business that has been forced to lay off employees or cut back on their coverage because it became too expensive. And it's about the fact that the biggest driving force behind our federal deficit is the skyrocketing cost of Medicare and Medicaid. So let me be clear: If we do not control these costs, we will not be able to control our deficit. If we do not reform health care, your premiums and out-of-pocket costs will continue to skyrocket. If we don't act, 14,000 Americans will continue to lose their health insurance every single day. These are the consequences of inaction; these are the stakes of the debate that we're having right now. And I realize that, with all the charges and criticisms that are being thrown around in Washington, a lot of Americans may be wondering, "What's in this for me? How does my family stand to benefit from health insurance reform?" So tonight I want to answer those questions, because even though Congress is still working through a few key issues, we already have rough agreement on the following areas. If you have health insurance, the reform we're proposing will provide you with more security and more stability. It will keep government out of health care decisions, giving you the option to keep your insurance if you're happy with it. It will prevent insurance companies from dropping your coverage if you get too sick. It will give you the security of knowing that, if you lose your job, if you move, or if change your job, you'll still be able to have coverage. It will limit the amount your insurance company can force you to pay for your medical costs out of your own pocket. And it will cover preventive care like checkups and mammograms that save lives and money. Now, if you don't have health insurance or you're a small business looking to cover your employees, you'll be able to choose a quality, affordable health plan through a health insurance exchange, a marketplace that promotes choice and competition. And, finally, no insurance company will be allowed to deny you coverage because of a pre-existing medical condition. I've also pledged that health insurance reform will not add to our deficit over the next decade, and I mean it. In the past eight years, we saw the enactment of two tax cuts -- primarily for the wealthiest Americans -- and a Medicare prescription program, none of which were paid for. That's partly why I inherited a $1.3 trillion deficit. That will not happen with health insurance reform. It will be paid for. Already we've estimated that two-thirds of the cost of reform can be paid for by reallocating money that is simply being wasted in federal health care programs. This includes over $100 billion of unwarranted subsidies that go to insurance companies as part of Medicare, subsidies that do nothing to improve care for our seniors. And I'm pleased that Congress has already embraced these proposals. While they're currently working through proposals to finance the remaining costs, I continue to insist that health reform not be paid for on the backs of middle-class families. In addition to making sure that this plan doesn't add to the deficit in the short term, the bill I sign must also slow the growth of health care costs in the long run. Our proposals would change incentives so that doctors and nurses are free to give patients the best care, just not the most expensive care. That's why the nation's largest organizations representing doctors and nurses have embraced our plan. We also want to create an independent group of doctors and medical experts who are empowered to eliminate waste and inefficiency in Medicare on an annual basis, a proposal that could save even more money and ensure long-term financial health for Medicare. Overall, our proposals will improve the quality of care for our seniors and save them thousands of dollars on prescription drugs, which is why the AARP has endorsed our reform efforts. Not all of the cost-saving measures I just mentioned were contained in Congress's draft legislation, but we're now seeing broad agreement thanks to the work that has been done over the last few days. So even though we still have a few issues to work out, what's remarkable at this point is not how far we have left to go, it's how far we've already come. I understand how easy it is for this town to become consumed in the game of politics, to turn every issue into a running tally of who's up and who's down. I've heard that one Republican strategist told his party that, even though they may want to compromise, it's better politics to "go for the kill." Another Republican senator said that defeating health reform is about "breaking" me. So let me be clear: This isn't about me. I have great health insurance, and so does every member of Congress. This debate is about the letters I read when I sit in the Oval Office every day and the stories I hear at town hall meetings. This is about the woman in Colorado who paid $700 a month to her insurance company only to find out that they wouldn't pay a dime for her cancer treatment, who had to use up her retirement funds to save her own life. This is about the middle-class college graduate from Maryland whose health insurance expired when he changed jobs and woke up from the emergency surgery that he required with $10,000 worth of debt. This is about every family, every business, and every taxpayer who continues to shoulder the burden of a problem that Washington has failed to solve for decades. This debate is not a game for these Americans, and they can't afford to wait any longer for reform. They're counting on us to get this done. They're looking to us for leadership. And we can't let them down. We will pass reform that lowers cost, promotes choice, and provides coverage that every American can count on, and we will do it this year. And with that, I'll take your questions. And we are going to start off with Ben Feller at Associated Press. Question: Thank you, Mr. President. Congress, as you alluded to, is trying to figure out how to pay for all of this reform. Have you told House and Senate leaders which of their ideas are acceptable to you? If so, are you willing to share that stand of yours with the American people? And if you haven't given that kind of direction to congressional leaders, are you willing to -- are you willing to explain why you're not stepping in to get a deal done, since you're the one setting a deadline? Obama: Well, before we talk about how to pay for it, let's talk about what exactly needs to be done. And the reason I want to emphasize this is because there's been a lot of misinformation out there. Right now, premiums for families that have health insurance have doubled over the last 10 years. They've gone up three times faster than wages. So what we know is that, if the current trends continue, more and more families are going to lose health care, more and more families are going to be in a position where they keep their health care but it takes a bigger bite out of their budget. Employers are going to put more and more costs on employees or they're just going to stop providing health care altogether. We also know that health care inflation on the curve that it's on, we're guaranteed to see Medicare and Medicaid basically break the federal budget. And we know that we're spending -- on average we, here in the United States, are spending about $6,000 more than other advanced countries where they're just as healthy. And I've said this before, if you found out that your neighbor had gotten the same car for $6,000 less, you'd want to figure out how to get that deal. And that's what reform is all about. How can we make sure that we are getting the best bang for our health care dollar? Now, what we did very early on was say two-thirds of the costs of health care reform, which includes providing coverage for people who don't have it, making it more affordable for folks who do, and making sure that we're, over the long term, creating the kinds of systems where prevention and wellness and information technologies make the system more efficient. That the entire cost of that has to be paid for and it has got to be deficit-neutral. And we identified two-thirds of those costs to be paid for by tax dollars that are already being spent right now. So taxpayers are already putting this money into the kitty. The problem is, they're not getting a good deal for the money they're spending. That takes care of about two-thirds of the cost. The remaining one-third is about what the argument has been about of late. What I've said is that there may be a number of different ways to raise money. I put forward what I thought was the best proposal, which was to limit the deductions, the itemized deductions, for the wealthiest Americans. People like myself could take the same percentage deduction that middle class families do. And that would raise sufficient funds for that final one-third. Now so far we haven't seen any of the bills adopt that. There are other ideas that are out there. I continue to think my idea is the best one. But I'm not foreclosing some of these other ideas as the committees are working them through. The one commitment that I've been clear about is I don't want that final one-third of the cost of health care to be completely shouldered on the backs of middle-class families who are already struggling in a difficult economy. And so, if I see a proposal that is primarily funded through taxing middle-class families, I'm going to be opposed to that because I think there are better ideas to do it. Now there are -- you know, I have not yet seen what the Senate Finance Committee is producing. They've got a number of ideas. But we haven't seen a final draft. The House suggested a surcharge on wealthy Americans. And my understanding, although I haven't seen the final versions, is that there has been talk about making that basically only apply to families whose joint income is $1 million. To me, that meets my principle that it's not being shouldered by families who are already having a tough time. But what I want do is to see what emerges from these committees, continuing to work to find more savings, because I actually think that it's possible for us to fund even more of this process through identifying waste in the system. Try to narrow as much as possible the new revenue that's needed on the front end. And then see how we can piece this thing together in a way that's acceptable to both Democrats and I hope some Republicans. Obama: Absolutely, it's my job. I'm the president. And I think this has to get done. You know, just a broader point, if somebody told you that there is a plan out there that is guaranteed to double your health care costs over the next 10 years, that's guaranteed to result in more Americans losing their health care, and that is by far the biggest contributor to our federal deficit, I think most people would be opposed to that. Well, that's status quo. That's what we have right now. So if we don't change, we can't expect a different result. And that's why I think this is so important, not only for those families out there who are struggling, and who need some protection from abuses in the insurance industry, or need some protection from skyrocketing costs, but it's also important for our economy. And, by the way, it's important for a family's wages and incomes. One of the things that doesn't get talked about is the fact that, when premiums are going up and the costs to employers are going up, that's money that could be going into people's wages and incomes. And over the last decade, we basically saw middle-class families, their income and wages flat-lined. Part of the reason is because health care costs are gobbling that up. And that's why I say, if we can -- even if we don't reduce our health care costs by the $6,000 that we're paying more than any other country on Earth, if we just reduced it by $2,000 or $3,000, that would mean money in people's pockets, and that's possible to do. But we're going to have to make some changes. We've got to change how health care is delivered to -- the health care delivery system works so that doctors are being paid for the quality of care, not the quantity of care. We've got to make information technology more effective. We've got to have the medical system work in teams so that people don't go through five different tests. Those are all critical to do, and we can do them. Now, I understand that people are feeling uncertain about this. They feel anxious, partly because we've just become so cynical about what government can accomplish that people's attitudes are, you know, even though I don't like this devil, at least I know it, and I like that more than the devil I don't know. So folks are skeptical. And that is entirely legitimate because they haven't seen a lot of laws coming out of Washington lately that helped them. But my hope is -- and I'm confident that, when people look at the cost of doing nothing, they're going to say, "We can make this happen." We've made big changes before that end up resulting in a better life for the American people. Question: Thank you, Mr. President. You've been pushing Congress to pass health care reform by August. Why the rush? Are you worried that, if you don't, there's a delay until the fall, the whole effort will collapse? Obama: A couple of points. No. 1, I'm rushed because I get letters every day from families that are being clobbered by health care costs. And they ask me, "Can you help?" And in a country like ours, that's not right. So that's part of my rush. The second thing is the fact that, if you don't set deadlines in this town, things don't happen. The default position is inertia, because doing something always creates some people who are unhappy. There's always going to be some interest out there that decides, "You know what? The status quo is working for me a little bit better." And the fact that we have made so much progress, where we've got doctors, nurses, hospitals, even the pharmaceutical industry, AARP, saying that this makes sense to do, I think, means that the stars are aligned and we need to take advantage of that. Now, I do think it's important to get this right. And if, at the end of the day, I do not yet see that we have it right, then I'm not going to sign a bill that, for example, adds to our deficit. I won't sign a bill that doesn't reduce health care inflation so that families as well as government are saving money. I'm not going to sign a bill that I don't think will work. And my measure of whether things work or not are listening to the American people, but also listening to health care experts who have shown that, in some communities, health care is cheaper and delivers a better result. I think we can achieve that. So I'm confident that, if we just keep at it and we keep working, we're diligent, we're honest, if we take criticisms that are out there and modify whatever plans are already working through Congress, so that it meets those concerns and those criticisms, that we can arrive at a bill that is going to improve the lives of the American people. And I'll give you one specific example. I think that there was legitimate concern that we had not incorporated all of the measures that could reduce health care inflation over the long term in some of the versions of health care reform that were coming out of the committee. Well, over the last week, working with not only health care experts, but also members of Congress who are concerned about this, we actually have now gotten a commitment to incorporate an idea that has a panel of doctors and health care experts advising on how we can get a better value for our money in Medicare. And every expert out there says this can be a valuable tool to start reducing inflation over the long term. So -- can I say this, though? If we hadn't had any kind of deadline, that change probably would never have surfaced until who knows when. And so, you know, I want to do this right, but the American people need some relief. Question: Thank you, sir. We were just talking in that question about -- about reducing health care inflation, reducing costs. Can you explain how you're going to expand coverage? Is it fair to say -- is this bill going to cover all 47 million Americans that are uninsured? Or is this going to be something -- is it going to take a mandate? Or is this something that isn't -- your bill is probably not going to get it all the way there? And if it's not going to get all the way there, can you say, how far is enough? You know, "OK, 20 million more, I can sign that; 10 million more, I can't"? Obama: I want to cover everybody. Now, the truth is that, unless you have a -- what's called a single-payer system, in which everybody is automatically covered, then you're probably not going to reach every single individual because there's always going to be somebody out there who thinks they're indestructible and doesn't want to get health care, doesn't bother getting health care, and then, unfortunately, when they get hit by a bus, end up in the emergency room and the rest of us have to pay for it. But that's not the overwhelming majority of Americans. The overwhelming majority of Americans want health care, but millions of them can't afford it. So the plan that has been -- that I put forward and that what we're seeing in Congress would cover -- the estimates are -- at least 97 percent to 98 percent of Americans. There might still be people left out there who, even though there's an individual mandate, even though they are required to purchase health insurance, might still not get it or, despite a lot of subsidies, are still in such dire straits that it's still hard for them to afford it and we may end up giving them some sort of hardship exemption. Obama: But -- I'm sorry, go ahead, Chuck. Obama: So -- so I think that the -- the -- the basic idea should be that, in this country, if you want health care, you should be able to get affordable health care. And given the waste that's already in the system right now, if we just redesign certain elements of health care, then we can pay for that. We can pay for it in the short term, but we can also pay for it in the long term. And, in fact, there's going to be a whole lot of savings that we obtain from that, because, for example, the average American family is paying thousands of dollars in hidden costs in their insurance premiums to pay for what's called uncompensated care, people who show up at the emergency room because they don't have a primary care physician. If we can get those people insured and, instead of having a foot amputation because of advanced diabetes, they're getting a nutritionist who's working with them to make sure that they are keeping their diet where it needs to be, that's going to save us all money in the long term. Question: Back to the politics of it, you've mentioned two Republicans in your opening statement, but you have 60 Democratic seats, a healthy majority in the House. Question: If you don't get this, isn't this a fight inside the Democratic Party and that Republicans really aren't playing a -- you can't really blame the Republicans for this one? Obama: Well, first of all, you haven't seen me out there blaming the Republicans. I've been a little frustrated by some of the misinformation that's been coming out of the Republicans, but that has to do with, as you pointed out, politics. You know, if you've got somebody out there saying not that -- you know, let's get the best bill possible, but instead says, you know, let's try to beat this so we can gain political advantage, well, that's not, you know, I think, what the American people expect. I am very appreciative that people like Chuck Grassley [R-Iowa] on the Finance Committee in the Senate, people like [Sen.] Mike Enzi [R-Wyoming], people like [Sen.] Olympia Snowe [R-Maine], have been serious in engaging Democrats in trying to figure out how do we actually get a system that works. And even in those committees where you didn't see Republican votes, we've seen Republican ideas. So, for example, in the HELP Committee in the Senate, 160 Republican amendments were adopted into that bill because they've got good ideas to contribute. So the politics may dictate that they don't vote for health care reform because they think, you know, it will make Obama more vulnerable. But if they've got a good idea, we'll still take it. And in terms of Democrats, the fact of the matter is that because this is a big issue, I think that a lot of Democrats have a lot of different ideas. Some of them had to do with regional disparities. For example, you've got some Democrats who are concerned that the Medicare reimbursement rates in their communities are too low, and so they'd like to see the bill incorporate higher rates for doctors and providers in rural communities to incentivize good care in those communities. That's a legitimate concern. But the minute you bring up that concern, then that adds money, which means that we then have to find additional dollars. So this is just part of the normal give-and-take of the legislative process. I'm confident at the end we're going to have a bill that Democrats and some Republicans support. You said earlier that you wanted to tell the American people what's in it for them. How will their family benefit from the health care reform? But experts say that in addition to the benefits that you're pushing, there is going to have to be some sacrifice in order for there to be true cost-cutting measures, such as Americans giving up tests, referrals, choice, end-of-life care. When you describe health care reform, you don't -- understandably, you don't talk about the sacrifices that Americans might have to make. Do you think -- do you accept the premise that other than some tax increases on the wealthiest Americans, the American people are going to have to give anything up in order for this to happen? Obama: They're going to have to give up paying for things that don't make them healthier. And I -- speaking as an American, I think that's the kind of change you want. Look, if, right now, hospitals and doctors aren't coordinating enough to have you just take one test when you come because of an illness, but instead have you take one test, then you go to another specialist, you take a second test, then you go to another specialist, you take a third test, and nobody is bothering to send the first test that you took, same test, to the next doctors, you're wasting money. You may not see it, because if you have health insurance right now, it's just being sent to the insurance company. But that's raising your premiums. It's raising everybody's premiums. And that money, one way or another, is coming out of your pocket. Although we are also subsidizing some of that because there are tax breaks for health care. So, not only is it costing you money in terms of higher premiums, it's also costing you as a taxpayer. Now, I want to change that. Every American should want to change that. Why would we want to pay for things that don't work? That aren't making us healthier? And here's what I'm confident about. If doctors and patients have the best information about what works and what doesn't, then they're going to want to pay for what works. If there's a blue pill and a red pill, and the blue pill is half the price of the red pill and works just as well, why not pay half price for the thing that's going to make you well? But the system right now doesn't incentivize that. Those are the changes that are going to be needed -- that we're going to need to make inside the system. It will require, I think, patients to -- as well as doctors, as well as hospitals, to be more discriminating consumers. But I think that's a good thing, because ultimately we can't afford this. We just can't afford what we're doing right now. And -- and -- and just to -- to raise a broader issue that I think has colored how we look at health care reform, let me just talk about deficit and debt, because part of what's been happening in this debate is the American people are understandably queasy about the huge deficits and debt that we're facing right now. And the feeling is, all right, we had the bank bailout, we had the recovery package, we had the supplemental, we've got the budget, we're seeing numbers, trillions here and trillions there. And so I think, legitimately, people are saying, "Look, we're in a recession. I'm cutting back. I'm having to give up things. And yet all I see is government spending more and more money." And that argument, I think, has been used effectively by people who don't want to change health care to suggest that somehow this is one more government program. So I just want to address that point very quickly. First of all, let's understand that, when I came in, we had a $1.3 trillion deficit -- annual deficit that we had already inherited. We had to immediately move forward with a stimulus package because the American economy had lost trillions of dollars of wealth. Consumers had lost through their 401(k)s, through home values, you name it, they had lost trillions of dollars. That all just went away. That was the day I was sworn in; it was already happening. And we had 700,000 jobs that were being lost. So we felt it was very important to put in place a recovery package that would help stabilize the economy. Then we had to pass a budget by law, and our budget had a 10-year projection. And I just want everybody to be clear about this. If we had done nothing, if you had the same old budget as opposed to the changes we made in our budget, you'd have a $9.3 trillion deficit over the next 10 years. Because of the changes we've made, it's going to be $7.1 trillion. Now, that's not good, but it's $2.2 trillion less than it would have been if we had the same policies in place when we came in. So the reason I point this out is to say that the debt and the deficit are deep concerns of mine. I am very worried about federal spending. And the steps that we've taken so far have reduced federal spending over the next 10 years by $2.2 trillion. It's not enough. But in order for us to do more, we're not only going to have to eliminate waste in the system -- and, by the way, we had a big victory yesterday by eliminating a weapons program, the F- 22, that the Pentagon had repeatedly said we didn't need -- so we're going to have to eliminate waste there. We're going to have to eliminate no-bid contracts. We're going to have to do all kinds of reforms in our budgeting. But we're also going to have to change health care. Otherwise, we can't change that $7.1 trillion gap in the way that the American people want it to change. So to all -- everybody who's out there who has been ginned about this idea that the Obama administration wants to spend and spend and spend, the fact of the matter is, is that we inherited an enormous deficit, enormous long-term debt projections. We have not reduced it as much as we need to and as I'd like to. But health care reform is not going to add to that deficit. It's designed to lower it. That's part of the reason why it's so important to do, and to do now. Question: Thank you, Mr. President. On Medicare, there are obviously millions of Americans who depend on Medicare. And when you talk about bending the long-term costs downward or when you talk about cuts in the current proposal on Capitol Hill, you talk about cuts in Medicare and they talk about cuts in Medicare, but there are never many specifics. Specifically, what kind of pain, what kind of sacrifice are you calling on beneficiaries to make? And even if not right away, aren't future beneficiaries going to be getting less generous benefits than today's? Question: And as a subsidiary question, what do you think about taking it out of the political realm and giving it to an outside body of experts to take the politics out of Medicare? Obama: Well, on the second point, that's exactly what our proposal is. It's called the MedPAC program. By the way, it was originally a Republican idea. I want to give credit where credit is due. The Republican Congress passed a bill that created a panel of health care experts to make recommendations to Congress on how we could get better quality, lower cost. The problem is, every year, it would just go on a shelf and nobody would act on it. So what we said is, let's give that body some power. Let's require Congress to vote on the proposals that they're making every year. Congress can still reject them, so it's not completely removing it from politics, but they have to reject or accept it as a package. And that, I think, would incentivize and empower important changes. But here's the thing I want to emphasize, Chip. It's not going to reduce Medicare benefits. What it's going to do is to change how those benefits are delivered so that they're more efficient. Let me give you a very specific example. You've heard that, as a consequence of our efforts at reform, the pharmaceutical industry has already said they're willing to put $80 billion on the table. Now, why is that? Well, the reason is, is because there's probably even more waste than $80 billion in terms of how the drug plan in Medicare is administered. We might be able to get $100 billion out or more, but the pharmaceutical industry voluntarily said, "Here's $80 billion." You know what that -- what that means? That means that senior citizens who right now have a so-called doughnut hole in their plan, where after spending a certain amount on prescription drugs suddenly they drop off a cliff and they've got to pocket the entire cost, suddenly half of that is filled. That's a hard commitment that we already have. So that's a change in how we are delivering Medicare. But you know what? It turns out that it means out-of-pocket savings for seniors. That's why AARP has endorsed us. OK. Question: During the campaign, you promised that health care negotiations would take place on C-SPAN, and that hasn't happened, and your administration recently turned down a request from a watchdog group seeking a list of health care executives who have visited the White House to talk about health care reform. Also, the TARP inspector general recently said that your White House is withholding too much information on the bank bailout. So my question for you is, are you fulfilling your promise of transparency in the White House? Obama: Well, on the list of health care executives who visited us, most of time you guys have been in there taking pictures, so it hasn't been a secret. And my understanding is we just sent a letter out providing a full list of all the executives. But, frankly, these have mostly been at least photo sprays (ph) where you could see who was participating. With respect to all of the negotiations not being on C-SPAN, you will recall in this very room that our kickoff event was here on C- SPAN and, at a certain point, you know, you start getting into all kinds of different meetings. Senate Finance is having a meeting; the House is having a meeting. If they wanted those to be on C-SPAN, then I would welcome it. I don't think there are a lot of secrets going on in there. And the last question was with respect to TARP. I -- let me take a look at what exactly they say we have not provided. I think that we've provided much greater transparency than existed prior to our administration coming in. It is a big program. I don't know exactly what's been requested. I'll find out, and I will have an answer for you. Question: Thank you, Mr. President. You've said the recent bank profits indicate that there's been no sense of remorse on Wall Street for risky behavior, that we haven't seen a change in culture there. Do you think that your administration needs to be taking a harder line on -- with Wall Street? And also, would you consider going a step further than your regulatory reform proposals and supporting a fee on risky activities that go beyond traditional lending? Obama: We were on the verge of a complete financial meltdown. And the reason was because Wall Street took extraordinary risks with other people's money. They were peddling loans that they knew could never be paid back. They were flipping those loans and leveraging those loans and higher and higher mountains of debt were being built on loans that were fundamentally unsound. And all of us now are paying the price. Now, I believe it was the right thing to do -- as unpopular as it is, it was the right thing for us to do to step in to make sure that the financial system did not collapse, because things would be even worse today had those steps not been taken. It originated under the Bush administration. We continued it because, whether you're on the left or the right, if you talk to economists, they said that this could have the kinds of consequences that would have dropped us into a deep depression, and not simply a very severe recession. Now, one of the success stories of the past six months is that we really have seen a stabilization in the financial system. It's not where it needs to be. But people are no longer talking about the financial system falling off a cliff. We've stepped away from the brink. And that's important because what it means is, there are a lot of companies right now that can go into the marketplace and borrow money to fund inventory, fund payroll, and that will help the economy grow as a whole. The problem is, now that the financial system has bounced back, what you're seeing is that banks are starting to make profits again. Some of them have paid back the TARP money that they received, the bank bailout money that they received. And we expect more of them to pay this back. That's a good thing. And we also think it's a good thing that they're profitable again. Because if they're profitable, that means that they have reserves in place and they can lend. And this is America, so if you're profitable in the free market system, then you benefit. But what we haven't seen, I think, is the kind of change in behavior and practices on Wall Street that would ensure that we don't find ourselves in a fix again, where we've got to bail out these folks while they're taking huge risks and taking huge bonuses. So what do I think we need to do? We've got to pass financial regulatory reform. And, you know, this is an example of where folks say, well, you know, should the Obama administration be taking on too much? The fact of the matter is if we don't pass financial regulatory reform, then banks are going to go back to the same things that they were doing before. In some ways, it could be worse because now they know that the federal government may think that they're too big to fail. And so if they're unconstrained they could taken even more risks. And so there are a number of elements of financial regulatory reform. With respect to compensation, I'd like to think that people would feel a little remorse and feel embarrassed and would not get million-dollar or multimillion-dollar bonuses. But if shame does not work, then I think one proposal that I put forward is to make sure that at least shareholders of these companies know what their executives are being compensated. And that may force some reductions. I think, at minimum, what we want do is to make sure that -- to the extent that the federal government is going to have to be a backstop just like the Federal Deposit Insurance Corporation, what everybody is familiar with, FDIC, the reason that when you put your deposits in your bank, you can have confidence that they're insured, that's paid for through bank fees. We may need to make sure that there is a similar mechanism in place for some of these other far-out transactions. So if you guys want to do them, then you've got to put something into the kitty to make sure that if you screw up, it's not taxpayer dollars that have to pay for it, but it's dollars coming out of your profits. Steve Koff of the Cleveland Plain Dealer. Question: Thank you. To follow up on Jake's question earlier, sir, so many Americans are concerned that this plan, particularly the government insurance, the public option, would lead to reduced benefits or reduced coverage. Two questions. One, can you guarantee that this legislation will lock in and say the government will never deny any services, that that's going to be decided by the doctor and the patient, and the government will not deny any coverage? And, secondarily, can you, as a symbolic gesture, say that you and the Congress will abide by the same benefits in that public option? Obama: Well, No. 1, not only in the public option, but the insurance regulation that we want to put in place will largely match up with what members of Congress are getting through the federal employee plan. That's a good example of what we're trying to build for the American people. The same thing that Congress enjoys, which is they go, there's a marketplace of different plans that they can access, depending on what's best for their families. Now, one of the plans that we talked about is a public option. And part of the reason we want to have a public option is just to help keep the insurance companies honest. If the insurance companies are providing good care -- and, as it is, they're going to be more regulated so that they can't deny you care because of a pre-existing condition or because you changed jobs or because they've decided you're too sick and not a good risk -- you know, with regulation, there's already going to be some improvement in the insurance industry. But having a public plan out there that also shows that maybe if you take some of the profit motive out, maybe if you are reducing some of the administrative costs, that you can get an even better deal, that's going to incentivize the private sector to do even better. And that's a good thing. That's a good thing. Now, you know, there had been reports just over the last couple of days of insurance companies making record profits. Right now, at the time when everybody's getting hammered, they're making record profits and premiums are going up. What's the constraint on that? How can -- how can you ensure that those costs aren't being passed onto employers or passed onto employees, the American people, ordinary middle-class families, in a way that over time is going to make them broke? Well, part of the way is to make sure that there's some competition out there. So -- so that's the idea. Now, to get to your -- your original question, can I guarantee that there are going to be no changes in the health care delivery system? No. The whole point of this is to try to encourage changes that work for the American people and make them healthier. The government already is making some of these decisions. More importantly, insurance companies right now are making those decisions. And part of what we want to do is to make sure that those decisions are being made by doctors and medical experts based on evidence, based on what works, because that's not how it's working right now. That's not -- that's not how it's working right now. Right now, doctors a lot of times are forced to make decisions based on the fee payment schedule that's out there. So if they're looking and you come in and you've got a bad sore throat or your child has a bad sore throat or has repeated sore throats, the doctor may look at the reimbursement system and say to himself, "You know what? I make a lot more money if I take this kid's tonsils out." Now, that may be the right thing to do, but I'd rather have that doctor making those decisions just based on whether you really need your kid's tonsils out or whether it might make more sense just to change -- maybe they have allergies. Maybe they have something else that would make a difference. So -- so part of what we want do is to free doctors, patients, hospitals to make decisions based on what's best for patient care. And that's the whole idea behind Mayo. That's the whole idea behind the Cleveland Clinic. You know, I'm going to be visiting your hometown tomorrow to go to the Cleveland Clinic to show -- to show why their system works so well. And part of the reason it works well is because they've -- they've set up a system where patient care is the No. 1 concern, not bureaucracy, what forms have to be filled out, what do we get reimbursed for. Those are changes that I think the American people want to see. ... which is why I say this is not about me. I've got the best health care in the world. I'm trying to make sure that everybody has good health care, and they don't right now. Obama: Oh. Well, I said Steve Koff, but he just stood up, huh? Well, that's not fair. Shame on you. Question: (Off-mic) so I appreciate that. You cited the Mayo Clinic and the Cleveland Clinics as models for the delivery of health care in the past. The Mayo Clinic, though, has some problems with House proposals, saying they're not focused enough on patients and on results. What do you expect to achieve tomorrow by going to the Cleveland Clinic, which hasn't stated an opinion? And are you expecting some form of endorsement from the Cleveland Clinic? Obama: I'm not expecting an endorsement. The Cleveland Clinic is simply a role model for some of the kind of changes that we want to see. I think it's important to note that the Mayo Clinic was initially critical and concerned about whether there were enough changes in the delivery system and cost-saving measures in the original House bill. After they found out that we had put forward very specific mechanisms for this MedPAC idea, this idea of experts getting the politics out of health care and making decisions based on the best evidence out there, they wrote in their blog the very next day that we actually think this would make a difference. OK.
All right, I tried to make that short so that Lynn Sweet would get her last question in. Question: Thank you, Mr. President. Recently, Professor Henry Louis Gates Jr. was arrested at his home in Cambridge. What does that incident say to you and what does it say about race relations in America? Obama: Well, I should say at the outset that Skip Gates is a friend, so I may be a little biased here. I don't know all the facts. ... it probably wouldn't happen. But let's say my old house in Chicago. But so far, so good. They're -- they're reporting. The police are doing what they should. There's a call. They go investigate what happens. My understanding is, at that point, Professor Gates is already in his house. The police officer comes in. I'm sure there's some exchange of words. But my understanding is, is that Professor Gates then shows his ID to show that this is his house and, at that point, he gets arrested for disorderly conduct, charges which are later dropped. Now, I don't know, not having been there and not seeing all the facts, what role race played in that. But I think it's fair to say, No. 1, any of us would be pretty angry; No. 2, that the Cambridge police acted stupidly in arresting somebody when there was already proof that they were in their own home; and, No. 3, what I think we know separate and apart from this incident is that there's a long history in this country of African-Americans and Latinos being stopped by law enforcement disproportionately. That's just a fact. And even when there are honest misunderstandings, the fact that blacks and Hispanics are picked up more frequently and oftentimes for no cause casts suspicion even when there is good cause. And that's why I think the more that we're working with local law enforcement to improve policing techniques so that we're eliminating potential bias, the safer everybody is going to be.